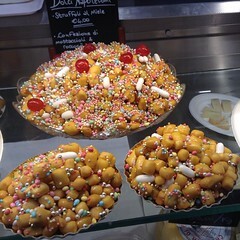 There are many delicious sweet treats associated with the holiday season in Italy. Learn about traditional cakes, cookies and pastries you can make at home or buy to celebrate. Italy is a country with a rich culinary history, and many traditions revolving around various religious holidays. And surely, no holiday has more traditional foods and treats associated with it in Italy than Christmas! Different cities and regions of Italy celebrate the Christmas season with a variety of sweet cookies, unique breads, special cakes, delightful candies and other forms of dessert. Here you will find an introduction to some of the most popular Italian Christmas treats - where they come from, where to buy them, or how to make them for yourself! So why not take a sweet tour of Italy with me and work up an appetite for this holiday season? You'll also find plenty of pre-made cakes, cookies, sweets and treats you can order now for holiday gift giving - or for enjoyment in your own home this Christmas. 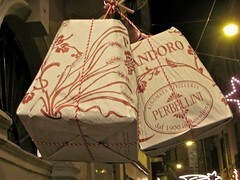 Image above: Panettone milanese. Source: codice 100 at wikipedia, released into the public domain. Panettone is perhaps the most well-known of Italian Christmas cakes, originating with the Milanese. This Northern Italian specialty is also enjoyed in the holiday season in Malta, Brazil and Switzerland. It is unique as preparing panettone typically involves a lengthy process of curing the dough, similar to sourdough, and proofing over several days to give it its fluffy texture.Surely you will find many of these sweet breads for sale every holiday season in Italian bakeries and specialty shops. It is a rich cake that keeps well - meaning it is also easy to order through mail-order catalogs and the internet without worry. 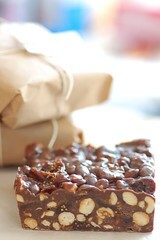 Traditionally it contains nuts, raisins, and candied fruit, but if you make your own you can accent it as you wish. 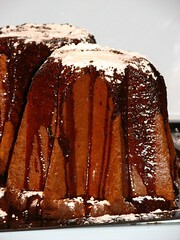 For dessert, slice vertically and serve with hot coffee or a sweet wine, such as a moscato. In our family, we best enjoy panettone for a decadent french toast after Christmas! Panettone Alla Milanese - a reasonably simple recipe. Another recipe for preparing panettone. 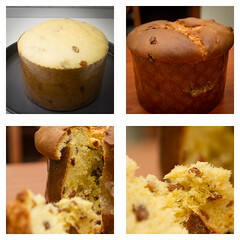 Panettone at Wikipedia - learn more about the bread's history and preparation. Italian Holiday Cakes Make Great Gifts! These already-wrapped Italian holiday cakes are perfect for gift-giving at this time of the year. Get some to bring to holiday parties as hostess gifts, for the office, or perhaps for your favorite neighbors, teachers and friends. They come in all different flavors like chocolate, cherry, vanilla and pear. 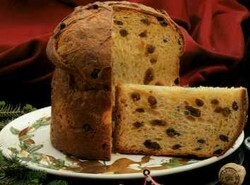 Scs6 Granducale Panettone Classico Recipe Made in Italy. Gourmet Sweet Bread Loaf. Want to make your own panettone instead? 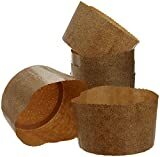 Qualita Paper Baking Moulds - Panettone - 6¾"
Similar to the Panettone is the Pandoro, which originated and is most popular in the Verona region of Italy. This bread has roots dating back to ancient breadmaking times, and the name, Pan d'oro, means "golden bread". In the Middle Ages white bread was consumed only by the rich (peasants had to suffice with black bread.) Breads enlivened with eggs, butter, sugar or honey were a delicacy for the palaces only, hence they became known as "royal" or "golden bread." A Pandoro is typically shaped like frustum and dusted with vanilla sugar frosting, to resemble the Alps of Northern Italy. The soft interior may be cut out and filled with sweet cream or gelato, or either can be served on the side. The first dessert known precisely as a Pandoro dates back to the 18th Century - and was, in fact, the last meal consumed by Benito Mussolini before his execution in 1945! Recipe for Pan d'oro - featuring many photographs and step-by-step instructions. Order Today for Your Holiday Season! Siena, Italy is a magical medieval city, stunning in its art, architecture and rich history. 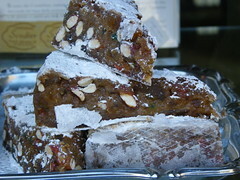 It also is home to a marvelous unique cuisine and special treats such as Panforte, sometimes simply known as "Siena Cake". 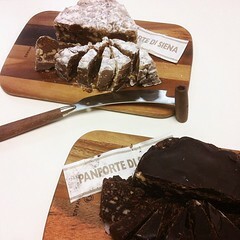 Panforte is in some ways similar to fruitcake, but chewy, dense and almost candy-like instead of bread-like. Fruits, nuts and spices are mixed with just enough flour to bind everything together, and then combined with a syrup of honey and sugar to moisten it for baking. Cocoa and chocolate can be added to some varieties. Panforte has a contentious history all of its own. Some claim it was the accidental invention of Sienese nuns in the 12th century, and it was delicious enough to even fight off the devil. Others claim Panforte dates back to the birth of Christ himself, the reward from Heaven after a young orphan offered Joseph his last crust of bread. Whichever the case, it has become a traditional Christmastime treat in the Siena area, although it is also enjoyed by visitors and residents year-round. With its dense consistency, it has a long shelf-life, and is believed to have provided nourishment to Crusaders on their quests and to those in the walled city surviving lengthy sieges. Panforte is traditionally prepared over a layer of Communion wafers, although today parchment paper can be used as a more practical substitute for the home chef. It is readily available year-long via on-line merchants and often offered by specialty markets during the holiday season. Only a small slice is needed per serving as it is quite rich. Try This Unique Tuscan Treat for Yourself! 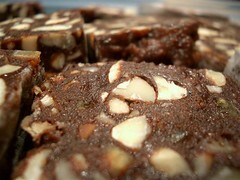 Panforte, meaning "strong bread", is a fresh, dense and chewy confection made with almonds, candied fruit and honey. Product of Italy. Made in Italy, perfect gift. 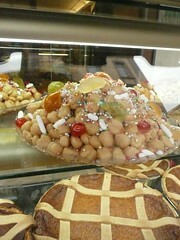 These pretty waffle cookies are very big around the holiday season in the Italian-American community where I live. 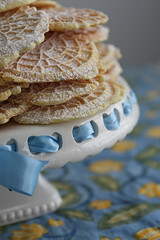 I remember my fiance's mom always making them for Christmas, and plenty of the older Italian women coming in to David's medical office always give him big plates of pizzelles and other cookies for the holidays. 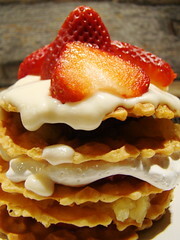 Pizzelles are made from flour, eggs, sugar, butter or vegetable oil, and some variety of flavoring. Lemon, vanilla, anise and chocolate are the most common varieties. 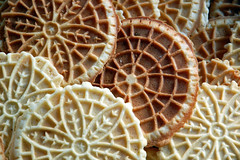 The Pizzelle originated in the Abruzzo region of South-central Italy - hence their popularity today among the immigrant communities in America, many of which came from that area. The origins of the pizzelle date back to the Roman crustulum, making it one of the oldest cookies in human history still known today. 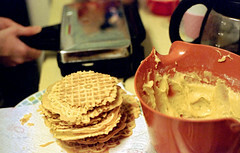 Pizzelles are made by pouring the cooking batter onto an iron, similar to a waffle iron, that is round and has a decorative pattern like a snowflake. 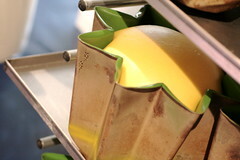 The iron was traditionally held over a hot stove flame, but today electric plug-in pizzelle irons are available as well. The cookies may be soft and chewy or crisp and hard, depending on taste and style. They make great, light, on-the-go snacks during the holidays, or can be turned into more elaborate desserts such as a sandwich of two pizzelles filled with cannoli cream. They are also great served with gelato or ice cream. If you are having a Neopolitan-style Christmas feast, then you simply must have some Struffoli to end the meal! These simple fried-dough balls are sweetened with honey and perhaps cinnamon and orange rind, Jordan almonds, or sprinkles and candied fruit. It is not exactly known when they became a Christmas staple, but their roots go back to the Ancient Greeks as a tasty small treat for ending a heavy feast. This San Francisco-based company has been importing fine Italian food items since 1919. Philadelphia-based Italian gourmet shop. 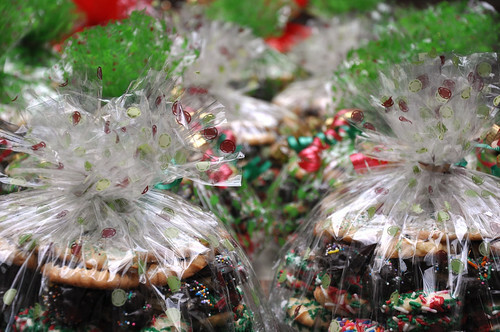 You can order on-line and have many items delivered right to your door, including seasonal holiday treats. A third generation Italian family owned and operated business outside of Boston, Massachusetts. 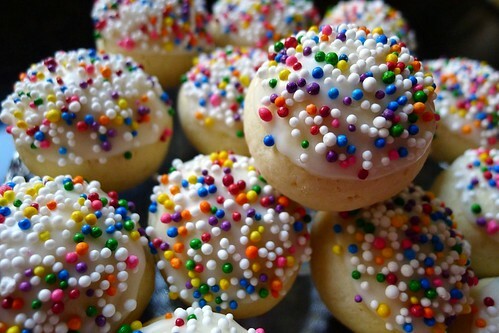 Order lots of Italian dessert specialties from hard candy and chocolate to traditional cakes and cookies. From New York's Little Italy to your front door. Recipes from "Mangia Bene Pasta"
Overview of Italian holiday desserts, with links to more information, recipes, etc. Thanks for stopping by this page about Italian holiday treats. Do any play a traditional role in your family holiday celebrations? Are there other treats you regularly enjoy? Please let me know! With all these featured mouth watering dishes, I feel like going to Italy and tasting them. Pandoro looks extremely delicious and tempting.